I didn't actually eat there since I got to Koblenz too late on Sunday afternoon, but there is a kitschy Greek restaurant "Delphi" in the building housing the tower and local Fixed Base Operator. If you click on the picture you might be able to make out the statues ... lots of them. So I what I really had was a two hundred euro pack of gummi bears ... the bears were technically free, a gift of the airport operator. Of course, I had to climb up to the tower and fork over a EUR 11.90 landing fee ... plus the cost of the round trip from Frankfurt via Heidelberg. 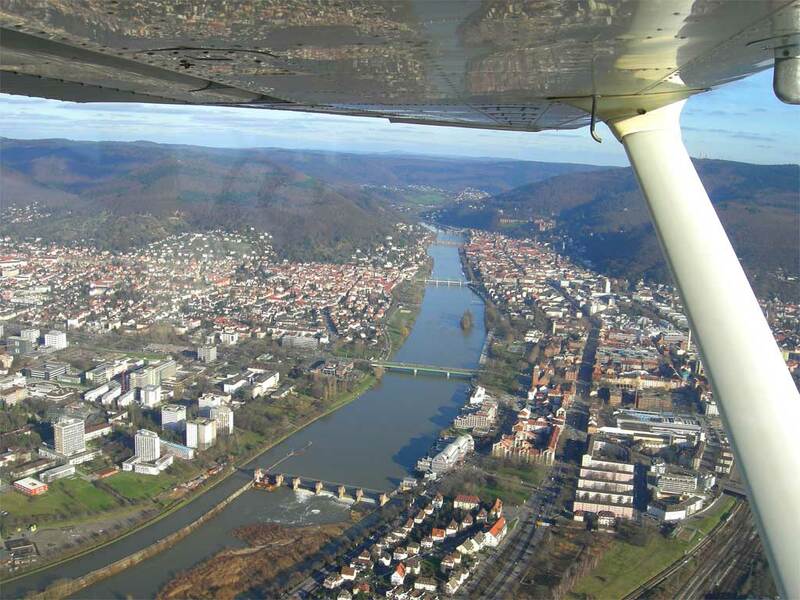 I took the long way, first down the A-5 to Heidelberg, where snapped this shot up the Neckar. I took a few other shots along the way, one of my office building a bit farther north, which I made my computer wallpaper today. "Oh, you are a pilot? 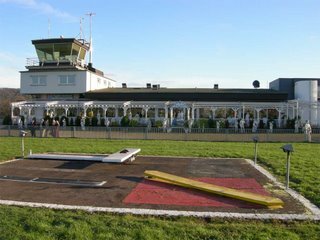 How many take offs and landings do you need to make each year to keep your license?" (Answer, no minimums to keep the license, but you do need to get checked out every two years to show you know what you are doing ... in any case practice is always advisable for your own safety, and you are required to do a number of takeoffs and landings every so often to maintain "recency" if you want to legally carry passengers). "Where did you get that picture?" I took it. "You can do that?" Yes, I can. "No, I mean, is that allowed?" You mean it isn't? Not just one person ... six people asked almost exactly the same sequence of questions. 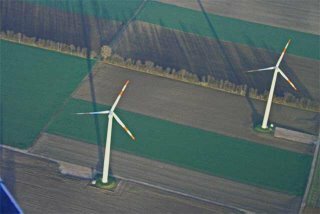 I'm amazed at how so many Germans arrive at the same set of questions, almost as if they are given a handbook in school of the thousands of questions they will need to ask with regularity as they go through life, always about matters of such minutiae ... Americans simply say, "Wow, nice photo." Anyway, I continued to the west for a few minutes to skirt around Mannheim's airspace ... I had transitioned it with their kind permission on my way south because I was low to take photos and wanted to stay away from the hills ... sorry, I think they call the Odenwald mountains ... so I didn't want to bother them any more on the west side. 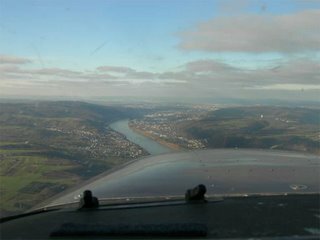 ... and I continued "down" the river to Koblenz (that still seems like up the river to me). It's a pretty flight on a nice day ... I'll have to do it again, and to try to get there early enough to try the Greek. Then I went back down the Rhein over Ruedesheim, and you can see here that the shadows were getting a little long, so I had to put a little more power in to speed things up, because landing too late can cost a lot more. And when I got home I had to go around the pattern one more time because another guy turned in short and cut me off. The tower said, "Can you extend your base and turn a little west to let him land?" Funny question, since I was now pointed at Frankfurt/Main airport and had no space left either to the west or the north, so I slowed it down some more and carefully turned inbound ... but I couldn't put enough distance between us, so around I went. But it ended well nonetheless. Cheated Death Again. Thanks for sharing! Nice photos (heh). I don't know what that one structure along the Rhine was, but it might be worth a trip north to find out. 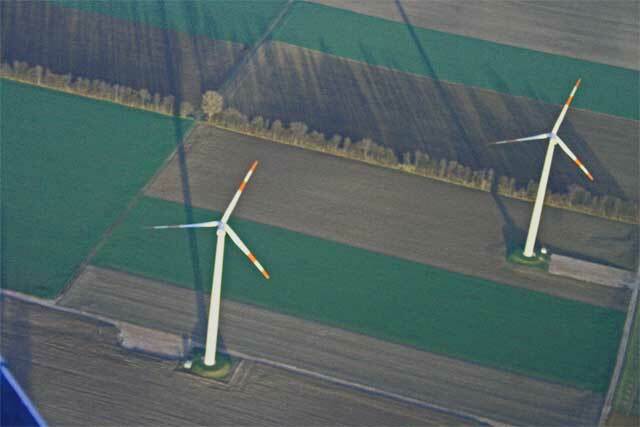 It looks really spectacular from the air. Hey great pictures! I really have to get Hubby to look at them. He was in Germany for 12 years flying for Pan AM and I know he would be so interested. ann: Thanks for the compliment. 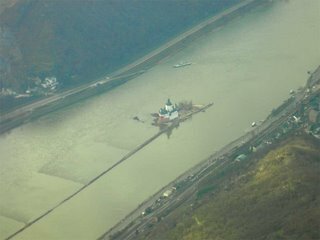 I believe that would be the Burg Pfalzgrafenstein, near Kaub in the Rhein gorge. 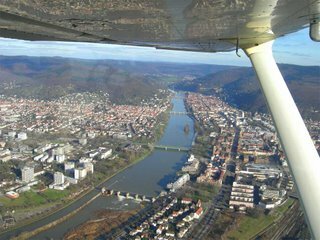 A great day trip if you are in teh vicinity of Frankfurt is to start up one side of the Rhein to Koblenz, cross over there and head back down the other side. You will have no shortage of castles, both restored and in ruins. maribeth: Thanks for the compliment. Can you ask hubby if he was peppered with the Landing question by inquisitive germans? Christina: A true compliment if ever there was one, as you have a superb photographer's eye. BTW, I can't wait to see your new kitchen, as I am looking for ideas ... I want a dark granite countertop (I know, so overdone in the last couple of years), but can't get the Partnerin to buy in. Maybe I should post a poll and see what the community thinks. I had no idea that we had an airport here in Koblenz. Where is it? Great pics. This region of Germany is stunning. Ha! Well, being American, the first thought it my mind was: "Hey, great shot of Heidelberg!" And then..."Hey! I think I see an alternate route to the Zollamt! Alright!"